Last week's claims for jobless benefits came in higher than expected at 339,000. Nonetheless, any print in the low 300,000s is considered a positive (considering where we came from). At the peak in 2008, the figure was in excess of 650,000! We also learned that the U.S. trade balance widened to $41.8 billion, and non-farm productivity ticked higher to 1.9%. This marked the strongest quarterly gain since the third quarter of 2012. Although today's data points were the first of the week, they were overshadowed by the Senate's confirmation hearing of the upcoming Fed Chair, Janet Yellen. Yellen has been the vice chair since 2010 and is widely expected to carry on the Bernanke tradition of "easy money" policy. Whether or not you agree with the Fed's quantitative easing experiment, you have to admit that Yellen sells it well...and we suspect she'll continue to act accordingly for the foreseeable future. Some questioned whether she could handle the national stage, but today's testimony suggests that she is a capable and prepared communicator. Policy aside, she appears to have thick enough skin to avoid inadvertently spooking the markets with off-hand comments under pressure. The Treasury market has spent this week removing some of the bearish speculative excess. However, the buying has not had the momentum we were hoping for. This suggests we are still in a minor short covering stage, but haven't yet reached a full-on short squeeze...which we think could be just around the corner. Janet Yellen continues to show the market her hand and it should translate into perpetually low interest rates. It is a well known premise in the trading community that there is more inherent "fat tail" risk in selling Treasuries than there is in buying them (despite this year's price action). This is in contrast to the equity market in which the bulls carry a higher "fat tail" risk. We aren't saying that bonds and notes will see an explosive move higher, but we do think the complex is a better buy than it is a sell from a risk and probability standpoint. **Consensus:** We continue to look higher; specifically, we believe the 30-year bond is headed to the 134 mark in the coming week or so. According to Janet Yellen, and most government stats, there is very little inflation. Yet, anybody short the stock market,sidelined in real estate, or feeding a hungry family, might feel differently. Nevertheless, if price pressures stay out of the data QE will live on. 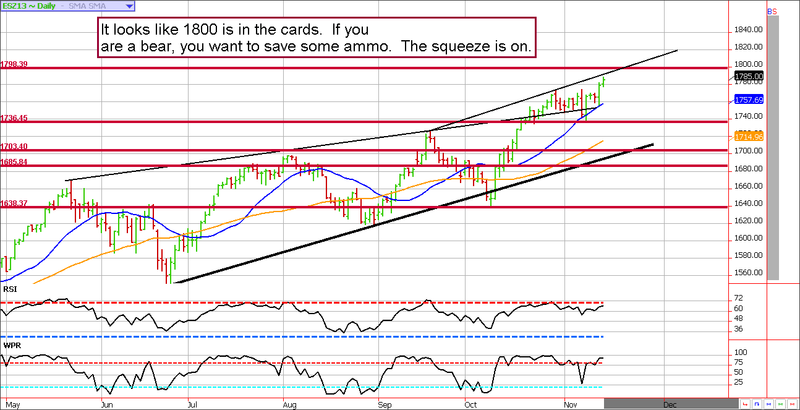 From a charting standpoint, it looks like the bulls will be shooting for 1800. We'd rather not see it, but if so it would likely be in the next day or two. After all, tomorrow is option expiration and markets like to find highs after the option traders have already suffered. We suspect there were plenty of put buyers on the dip earlier this week; those will be expiring worthless. Similarly, there are likely call sellers that complacently held through yesterday's rally (guilty) who are now being forced to buy futures to offset their risk (which is propelling prices higher and will likely do so through tomorrow's expiration). Once the market is done chewing these option traders up, there is potential for a reversal (near 1800). If you are following our short call trade, we are short the December 1800 calls from about $14/$15. They are slightly underwater at the moment but we are willing to give it a few more days. Although hind sight is 20/20, we really wish we would have taken the moderate profit we had in the position yesterday. We were shopping for prices but weren't quick enough to take action. **Consensus:** We've been mentioning that we wouldn't be willing to get aggressively bearish unless higher prices were seen; well, we are almost there. 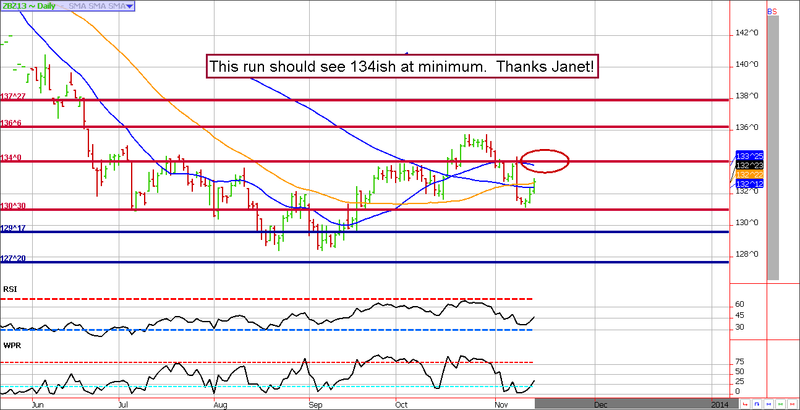 1800 looks likely, but this could be a spot for the bears to give it a shot.